Gor Mahia have signed Ugandan defender Israel Emuge ahead of the coming Kenya Premier League (KPL) and continental matches. The immediate Kira Young FC defender has penned a two year deal with Ko’galo.The club is currently bolstering their squad in a bid to land the ever elusive league title after dropping over six players. Long term target Paul Mungai Kiongera has finally joined the outfit to end the long running speculation over his future. Club secretary George Bwana confirmed the club has signed the duo to beef up their side. Kiongera was prolific in the ended season for KCB emerging as the KPL player of the season runners up and was also instrumental for the Kenyan development side-the under23. His arrival is expected to add more punch in K’ogalo’s attack. Also joining the ’Green Army’ is the head coach Zdravko Logarusic who is expected to join the team by January 15 for the pre-season training. Holidaying Gor Mahia FC Coach Zdravko Logarusic will have final say over the signings made by the club’s officials in the on-going transfer window. According to Senior Vice Chairman David Kiilo, they are in contact with the tactician who will determine the fate of the new recruits when he jets-in on Wednesday 2 January. -We were targeting sign six players and the coach is quite aware of the targets. -Apart from David Otieno, the rest of the players will be thoroughly assessed by the coach [Logarusic] before signing them. -He is still our coach and he will be with us when we resume training, said Kiilo to futaa.com. The defending Domestic Cup champions are expected to resume training on Wednesday next week. Gor Mahia have agreed in principle with KCB forward Paul Mungai Kiongera to have him cross over to the 2012 KPL Top Eight champions at the beginning of next season. Kiongera was KCB’s top-scorer, having netted 10 of the club’s 35 goals in the recently concluded campaign. He was also runner up in the Kenyan Premier League Footballer of the Year Awards, losing out to Gor Mahia’s Dan Serunkuma. The imminent switch was confirmed by Gor Mahia’s secretary general George Bwana, who said that they have had extensive talks with the player and officials from his club and that they have reached an agreement. “We went into negotiations aimed at having the player join us in the new season and I can now confirm that we have made positive headway. We are now working out the details of the contract and we shall soon be putting pen to paper,” said Bwana. Speaking of the player’s qualities, Bwana described him as a skilful midfielder, one who would be a positive addition to their side. “We need players of his calibre on our side, and with him joining us, we shall be a very strong side come 2013,” said Bwana. AFC Leopards had expressed an interest in the player, but have seemingly lost out on their man. hile Gor officials insist coach Zradvko Logarusic is coming back to the club, the Croatian is looking elsewhere. In a posting on his official website, the coach said he is available to take up a coaching role elsewhere in a move that should force Gor to start thinking of life without him. Logarusic has posted all his achievements in Kenya with Gor Mahia and as an individual together with his credentials. Attached are also pictures of him receiving the Kenyan Premier League (KPL) coach of the year award. When he left the country three weeks ago, Logarusic was categorical he did not have a deal with Gor and was open to a move elsewhere. The bone of contention was the high salary he was demanding, which Gor officials insisted was unreasonable but were willing to negotiate further. Last week, Gor Secretary General George Bwana said they expect the coach back home on January 2 after his holiday. Elsewhere, former Thika United coach Abdalla Juma is back in the KPL after signing for KCB. Juma was formerly coach of division one side Bidco United. He is back on familiar territory after having handled Thika United for seven years previously. He takes over from James Omondi who was sacked by the bankers due to poor performance. Tusker Premier League [TPL] giants Gor Mahia are close to finalizing a move for KCB playmaker Paul Kiongera and former Tusker striker Obadiah Ndege. Kiongera has been a target for K’ogalo since June and according to Gor’s deputy Secretary-General Ronald Ngala, the midfielder deal is almost done. -We have agreed with the players and their mother clubs. I am 90% certain that Kiongera and Ndege will join us. 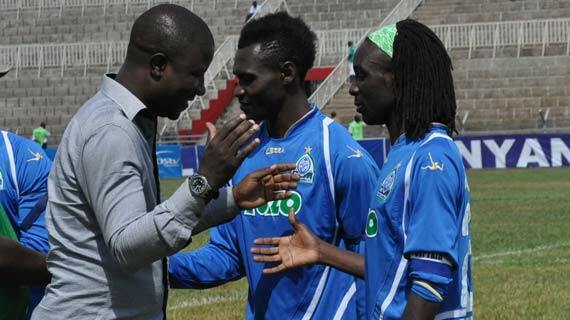 -We might finalize the deals today, said Ngala to futaa.com. Ndege was dropped on Monday 17 December by the TPL champions. Elsewhere Gor Mahia have confirmed that they agreed a deal with Ugandan Super League side Kira Young for the transfer of defender Israel Emuge. The former URA defender is expected to link-up with K’ogalo before January 2 2013-when the team resumes training. In an interview with futaa.com, Gor’s deputy Secretary-General Ronald Ngala admitted that they have slowed down the recruitment process after CAF extended the deadline for submitting the players’ list. -CAF has extended deadline for submission to December 31st. That is to our advantage. It is true we have slowed down the recruitment process because we want to sign the best. -We have already agreed with Kira and Emuge will be joining us before we resume training, said Ngala. Rama Salim leaves the country this weekend for a series of trials in Europe and the Middle East, but his club has said they are not aware of the move. Gor Mahia Secretary General George Bwana, while insisting that they cannot stand in the way of the player’s progress, said they need to be informed of any move he is about to make. “I have not heard that he is going anywhere for trials though this does not mean that he is leaving the club. Trials are just that because at the end of it the club interested in his services still has to talk to us. We want to know where he is going because he still has a contract with us,” he said. Salim joined Gor Mahia last season after starring at relegated KPL side Congo United. Salim’s combination with Ugandan import Dan Sserunkuma was responsible for helping Gor finish second in the just concluded season and will be difficult to replace if he decides to move away. Tusker Premier League (TPL) giants Gor Mahia have sealed the swoop for Muhoroni Youth striker Abbey Natty Kunrunmi, an official at the club who asked not to be named has confirmed to futaa.com. According to the official, the player, recently feted as the country’s elite league’s best new player in the 2012 season, has already signed a two – year deal at the team and will be among the players to do duty for the club in the Confederations Cup in 2013. -Gor Mahia has signed Abbey on a two year deal and the player’s name is even among the names to be fronted to CAF for the continental games. He signed on Sunday 16 December, the official said. Abbey joined Muhoroni Youth FC from Ligi Ndogo during the 2012 midseason break and the speedy Nigerian proved an instant hit with the TPL rookies. The player was, however, unreachable for confirmation of the same. Kenyan international Kevin Omondi and his fellow Fisa Academy graduate Musa Mohammed have signed a one-year contract extension with Premier League giants Gor Mahia. Confirming the new development to the club’s official website, senior vice chairman David Killo said that the duo had been targeted by KPL champions Tusker. Despite the brewers’ interest, the pair have decided to extend their stay at K’ogalo with each one penning down a new one-year deal. “Tusker had been following the two players but I am happy they have decided to stay at the club. This shows they have confidence in the club,” said Killo. Omondi, who featured for Kenya in the recently concluded Cecafa Senior Challenge Cup in Uganda, has been a revelation at Gor Mahia – especially in the second leg of last season where he was the main architect of their goals. Ade, as he’s popularly known, propelled K’Ogalo to the final of the FKF President’s Cup with a clinical finish during their 2-1 win over arch-rivals AFC Leopards in the semifinal at MISC-Kasarani. Even though his teammate, Mohammed, has had less playing time this season, the defender was among the Kenya U23 team that played against Senegal and Guinea in build-up matches early in the year. Their contracts were due to expire at the end of this month. Eddie Mubiru the Ugandan midfielder who has been on Tusker Premier League (TPL) giants Gor Mahia’s radar for the past few months could well be poised for a confirmation at the club in the near future. According to gormahiafc.co.ke, the Kampala City Council (KCC) player is the subject of club secretary general George Bwana and coach Bobby Ogolla’s trip to Uganda as they look to finalise the deal that blew hot during the midseason transfer period but went cold thereafter. As reported by the site, while in Kampala, the two will also be looking at other players who may fit in the team’s plans for 2013. -Mubiru suits our requirement, we have been with him and it is about time we brought him home. His deal is our major project in Uganda but as a football club we are also open for more choices should any come along. We are in the transfer market but first we must sign Mubiru, Bwana said. The team’s coach in the 2012 season Zdravko Logarusic had earlier described the player as one with a great future ahead even as the issue of his transfer dragged on. Tusker Premier League giants Gor Mahia will bolster its squad for next season by signing quality players within and outside the country. Gor are scheduled to face Seychellois side Anse Re-Union in the preliminary round of the CAF Confederations Cup in February 2013, and for them to perform better, the Executive Committee has vowed to work closely with the technical bench in the recruitment process. -This time we want to assemble a stronger side in the competition. -We are working closely with the technical bench to ensure we sign quality players from within and outside the country so that we can have a strong team that can challenge for the title and not just compete, said Secretary General George Bwana to the club’s official website. Last year, K’ogalo was eliminated from the first round of the same competition by losing to Mozambique’s Ferroviaro de Maputo. Gor will host Re-Union on the weekend of 15-17 February 2013 in the first leg tie before travelling to Seychelles after two weeks for the return league. The aggregate winner from this round will qualify for the first round where they will meet Egyptian side ENPPI.